PDF format has bookmarks option that allows getting quick and easy access to any part of the file. When you combine a few PDF files into one, it would be reasonable to make the table of contents that contains each document title. Having these bookmarks you will be able to jump into any document inside a combined file. 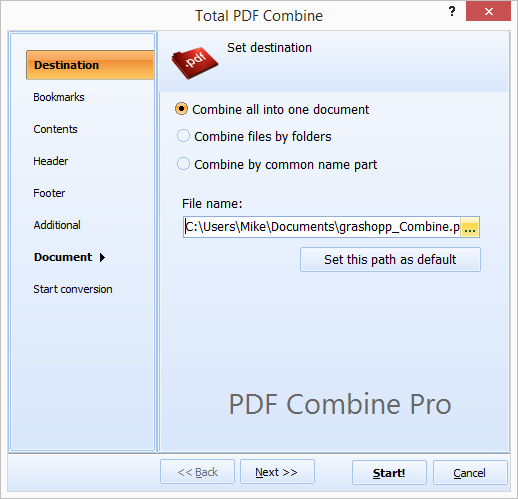 With PDF Combine Pro you can generate the table of contents automatically. Besides document titles you can use file names for creating the bookmarks. If your original PDF files contain their own bookmarks, you can port them into the resultant PDF copy together with other content. It is also possible to use external file with captions for generating the bookmarks of the output file. "We tested your new version of PDFCombinePro on a number of our document packets.. one of them consisted of 173 pdf files resulting in a 30+MB pdf file. The table of contents worked flawlessly!!! Pagination worked great. You folks are awesome and we can't thank you enough. Also, just to let you know.. We reviewed numerous different PDF "Converters" trying to find something that would do what we needed. Here are just a few of the ones ranging in price from $35 to over $800 we looked at: Adobe Acrobat (does NOT have a real command line script capability), PDFtk (doesn't have your command line and bookmark table of contents capability), Neevia PDF Merge (sent me mail saying bookmark table of contents was not supported), pdf-tools.com (DOES support command line and table of contents bookmarks.. but it's over $800), a-pdf.com (supports bookmark table of contents but only from file names. You support bookmark table of contents using "document names" which is critical to our needs), verypdf.com (Doesn't have table of contents with bookmark functionality), pdfsam.org (does not support your capability), evermap.com (a plugin for acrobat with "autobookmark" capability does not support a table of contents), Aquaforest PDF toolkit (was too expensive so I didn't even look at its capabilities). PDF Combine Pro was our last hope.. It did everything we wanted." Make other settings if needed, and press Start! Soon the program will open the destination folder with the resultant PDF document that will contain all the source documents. This PDF file will have the table of contents with each item linking to a proper document. Another setting is editable header and footer. It is very convenient to add stamps to every PDF sheet, adapting it for your business standards. Text styling and positioning are adjusted inside Header and Footer tabs. There are even preset text variants available. 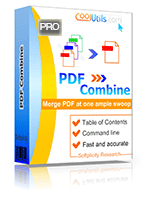 Download PDF Combine Pro to merge your documents into one PDF file with easy and comfortable navigation inside!